You all know about Abbeydale, right? Well, I wanted to fins out a little bit more about this brewery and its people, the hows and the whys and the wherefores. So we had a little chat. Abbeydale is a really interesting part of Sheffield, arty and creative with a beautifully renovated picture house at its heart. Are you from there or did you choose the location because of what the area is like? Our owner Pat Morton has lived in this area his whole life, so when he started a business he was keen for it to be in his home area and indeed still walks to work most days. That said I’m not sure it was quite so arty and creative when we first started! But the area is really flourishing at the moment and we’re very lucky to be surrounded by some brilliant neighbours – there’s a sense of proper neighbourhood and community which is so nice to be a part of. We have Forge Bakehouse just across the road who we’re working with at the moment – they’re using our beer in some of their bread and in exchange we’re trialling their sourdough culture in a mixed fermentation beer. There’s also some great independent bottle shops just round the corner, Hop Hideout and Turners, and Birdhouse Tea Co who have created special tea blends for us to use in some of our specials. How and when did Brewing start for you? 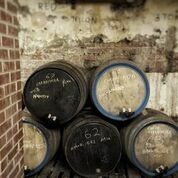 The brewery has continually grown throughout it’s existence and we now employ around 25 members of staff. 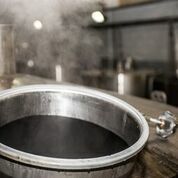 Many of our brewers have started their brewing careers with us and work their way up. As a business learning and development is really important so the entire team has the opportunity to study for the IBD (Institute of Brewing and Distilling) General Certificate in Brewing and we’re all encouraged to get involved wherever we want to. So for example, my role is generally very much office based but I still have chance to have input into recipes and have designed and brewed my very own beer! Even as we’ve grown and become a pretty big business, it’s still small enough for everyone to truly feel involved and valued and play a part in shaping our future. Tell me a little about where you brew and what kind of kit you use. We’re still in the same premises we started in, although it’s changed a bit in the past 22 years! From one unit we’re now in three, so our set up is a little on the unconventional side but we manage to make it work through a mixture of imagination and determination! We’re quite hidden away, but we’re very much a working brewery and not open to the public, so this works pretty well for us at the moment. Laura – our original mash tun is still in use, now as our hopback… I love that we’ve kept this as an integral part of our brewing process even though it’s outgrown it’s intended use! I love how your cans look. Who designs them for you? Thanks! 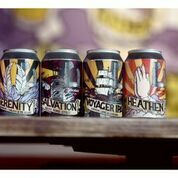 Our Brewers Emporium range, including our flagship canned beer Heathen, is all designed by James Murphy, who’s been working with us since 2016. His characteristic, hand drawn style really lets the beers stand out on a shelf and gives each one a distinctive personality. He’s taken our tongue-in-cheek ecclesiastical roots and really run with them, adding a dash of humour in amongst dark and emboldened images of adventure. Outside of this range, the artwork comes from a mixture of sources, especially for our collaborations. We love showcasing local artists… the design for our Nelson Sauvin DIPA (brewed in collaboration with Vibrant Forest) was created by Rob Lee, a Sheffield based graphic artist, and our Kid Ryenamite collaboration with Alphabet and You Scratch My Back smoked porter were designed by another local chap and good friend of ours Richard Bell. Any interesting plans for the future you might like to tell us about? YES. 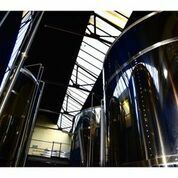 We’re waiting on the arrival of a few new tanks which are going to enable us to start delving in to the world of lager! We’re hoping to have our recipe and process locked down by the end of the year all being well, and we’re really excited to get started on this project. At the moment we’re not exactly blessed in terms of available space in our current premises, but we are actively looking to expand. There’s a few possibilities on the horizon but nothing concrete yet, we’ll let you know as soon as we have anything further to share! But ideally we’d love a space where we can not only increase production (including our barrel store to enable our Funk Dungeon project to continue to grow) but also have a brewery taproom and a pilot kit so our brewers can really let loose. Talking of the Funk Dungeon, we’ve also got a beer festival coming up which we’re holding here in the brewery itself. Funk Fest is taking place on Saturday 25th and Sunday 26th August and is to be a celebration of sour and mixed fermentation, showcasing a range of breweries from around the UK and Ireland who are really elevating this beer style at the moment. There’ll be around 10 lines of our Funk Dungeon releases as well which we can’t wait to share with you all. Thanks to the Abbeydale gang for taking their time to talk to me. More information about the brewery can be found on their website. 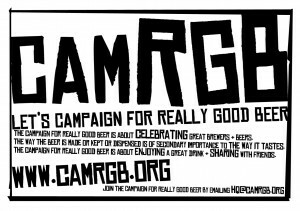 This entry was posted in Beer Events, Beer Travels, Brewery, CAMRGB, Interview and tagged Barrel Aged, Beer, Brewery, CAMRGB, Can, Canned beer, Drinking. Bookmark the permalink.